DIRECTV plays on the term used in the 1990s for satellite TV, “Direct Broadcast Satellite.” Although practically no one uses the term DBS anymore, it is a fair description of the difference between modern satellite TV and the alternatives at the time. Back then, most of the satellite dishes belonged to cable companies, and those that did not belonged to hobbyists. Satellite service was really more narrowcasting than broadcasting, as it was accessible to only a few people. DIRECTV’s original logo actually looks very sharp and contempory today. Almost better than their current one. DIRECTV’s idea was to cut out the middleman (no one really likes middlemen) and bring you the same programming as the cable company, straight to your home. It really was “direct tv.” DIRECTV’s old logo is a clever mix of the letter D and a cyclone (the white part is what is supposed to look like a cyclone.) If you think it’s a little weird that a company would purposely compare themselves to a destructive force of nature, this was in the days before superstorms were common, and even when it was the official company logo DIRECTV didn’t use the term “cyclone” except internally. The name DISH, though seemingly straightforward, is actually even more convoluted in its history. The company once known as DiSH Network used “dish” as both a backronym (an acronym built specifically to make a specific word, like Marvel’s SHIELD) and to indicate the dish antenna itself. If you look at the DISH logo you’ll see that there really isn’t an “I”. The “I” is formed from the satellite dish beaming from space. DiSH originally stood for Digital Satellite Home, which was really just another way of saying Digital Broadcast Satellite. Like DIRECTV’s cyclone, DISH’s attempt at a clever acronym isn’t mentioned much anymore. 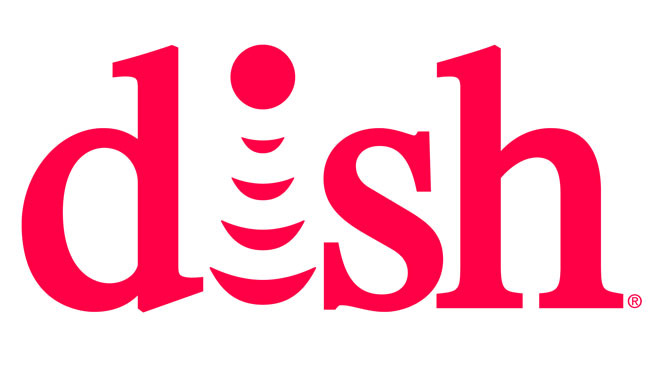 DISH also rebranded itself a few years ago, dropping “Network” and getting rid of the now-dated oval that seemed to take over graphic design in the mid-1990s. This move makes sense since they were never really a single network anyway. Since DISH is looking forward to becoming a wireless services company, it wouldn’t surprise us to see even more changes to its identity, which is completely tied to the idea of satellite, but in the meantime the current presentation is very clean and attractive.